This week we welcome back Joe Rinaldi from a 2 week tour of NSW in support of Father Chris Riley’s Youth Off The Streets (YOTS) charity. 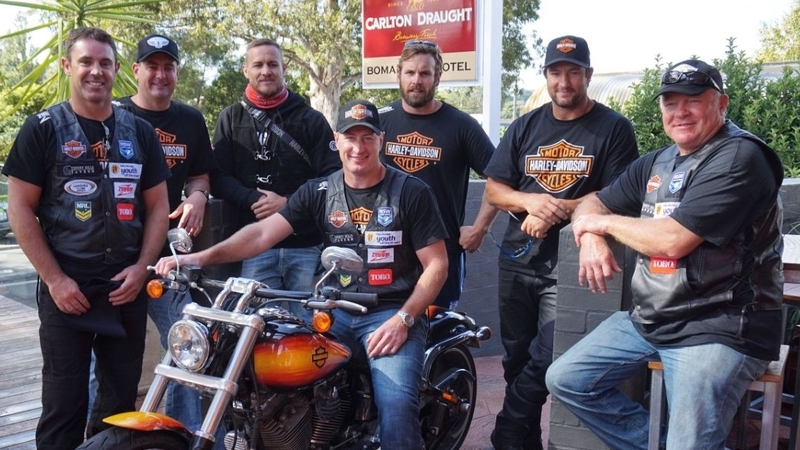 Hogs for Homeless was first thought up back in 2012 by NSW legend Brad “Freddy” Fittler when he was confronted by the shocking statistic that their are nearly 47,000 homeless people in Australia under the age of 25 years old. Since it’s inception Hogs for Homeless has raised over $300,000 for YOTS and continue to support this amazing cause. Brookvale Mazda were proud to partner with NSW Rugby League to support this years tour, with our fearless leader Joe joining ‘True Blue’ legends Brad Fittler, Nathan Hindmarsh, Matt Cooper and Steve Menzies. As well as raising funds for YOTS, the Hogs will be helping to raise funds and awareness of local league clubs and distributing 3000 balls to NSW children. The tour will conclude this Friday March 4th, with the riders to perform a lap of honour before the Sea Eagles-Bulldogs Round 1 NRL clash at Brookvale Oval. If you would like o offer your support to YOTS visit their website https://youthoffthestreets.com.au for more information.